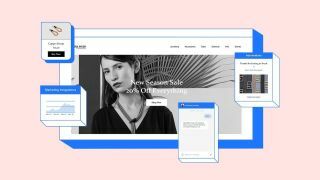 Website builder giant Wix has launched a new suite of 20 products geared towards entrepreneurs that allows them to manage and promote their business as they work on their site. The new Ascend platform will be offered as an additional subscription for existing customers, with tiered pricing to cater to the needs of smaller businesses. Entrepreneurs and small business owners can promote their site, manage customer interactions, run marketing campaigns and capture leads to help them convert traffic into sales. Ascend also looks to makes it easier for businesses to connect with customers, offering a chat-centric interface with real-time interactions, as well as the ability to automatically respond to user queries. There are also a range of SEO tools, including the ability to create social media posts and product videos right from Wix. The 20 products included with Ascend combine new offerings along with others that were previously available on the Wix platform. Users can also enable Automations to set up triggers to automate and manage interactions with customers. According to Wix, businesses that have implemented this feature have seen 151 per cent more site traffic compared to those who haven't yet added this product to their sites. Wix customers interested in trying out Ascend can do so for just $10 per month with the basic package, $24 per month with the Professional package and $49 per month with the Unlimited package. The basic package caters to entrepreneurs and new startups while the professional and unlimited packages are better suited for established SMBs trying to grow their business further.